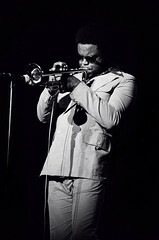 Freddie Hubbard died today at Sherman Oaks Hospital  as a result of a heart attack suffered in late November. His name might not blow up the same marquee lights as that of the late Eartha Kitt , whom we lost on Christmas Day, but anyone who cultivates even a passing interest in jazz certainly knows Hubbard’s swift, mercury-smooth trumpet sound, whether they realize it or not. Indeed. They’ve got audio, over there, too. Check it out. In my view, Hubbard should be required listening for anyone wanting to understand Jazz. Copyright © 2016 The Conservative Reader. All rights reserved.